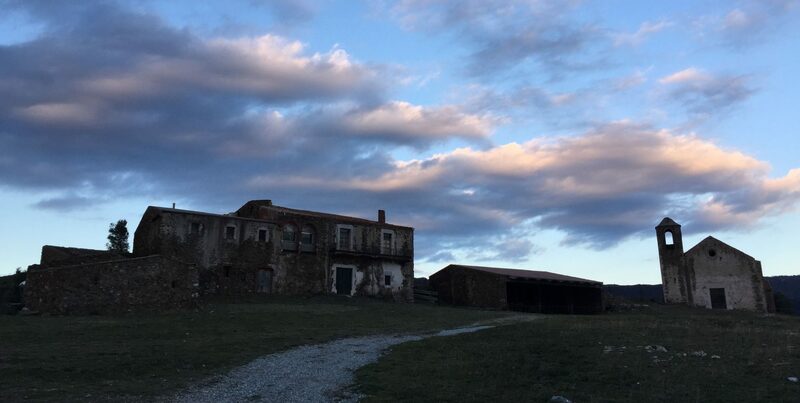 The first Borges story I ever read was ‘Tlön, Uqbar, Orbis Tertius’, in the translation by Alastair Reid, while living in a derelict shepherd’s hut on a Cretan hillside. A couple of years later, like so many others readers, I underwent a kind of epiphany while reading One Hundred Years of Solitude. 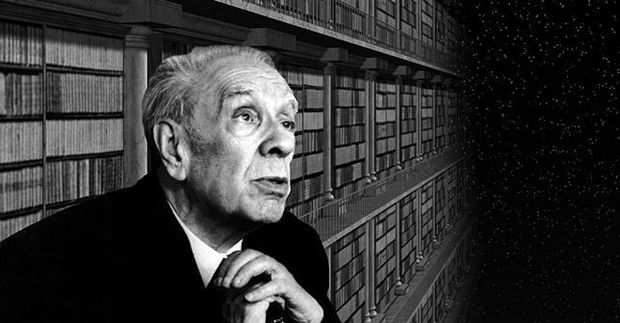 I was twenty years old, and from that point on, Borges’ fictions, alongside García Márquez’s recreation of the semi-fictional world of Macondo, forced me to re-evaluate almost everything that I had been reared to believe about literary fiction. Thinking back, I had never had much truck with either realism or naturalism – the antagonists, in their way, of so-called ‘magic realism’ – and since my exposure to Borges and García Márquez, I never quite trusted them again. These two writers, followed by other discoveries, such as Juan Rulfo, Julio Cortázar, Carlos Fuentes, Mario Vargas Llosa and Augusto Monterroso, opened the doors to different perceptions of reality, in which the frail membrane separating one world, one mode of understanding, from another, was always permeable, subject to movement and interpenetration. Everything was a fiction. This was a model, I believed, that could be applied to almost anything: culture, language, philosophy . . . it was almost, but not quite, a religion. 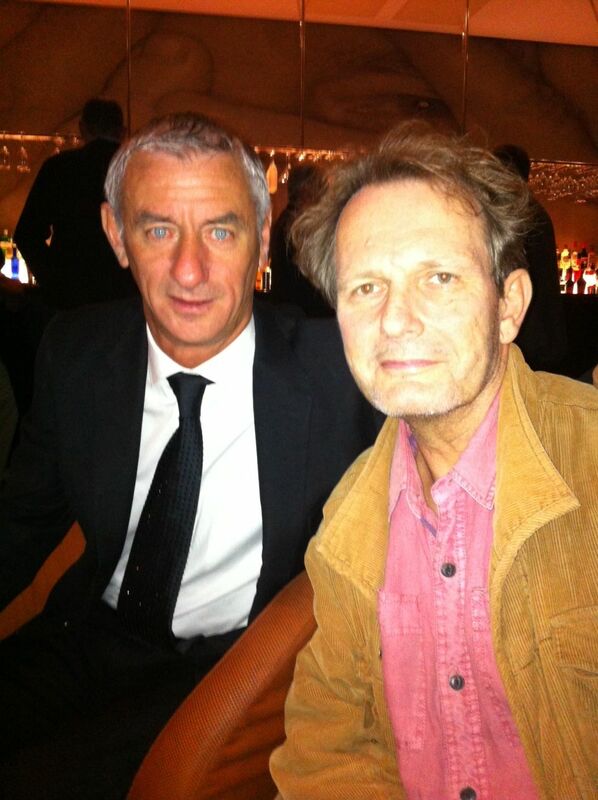 Last July I was reminded of this lifelong struggle with the false dichotomy between fiction and reality, when I travelled to Dumfries and Galloway to meet Alastair Reid himself. 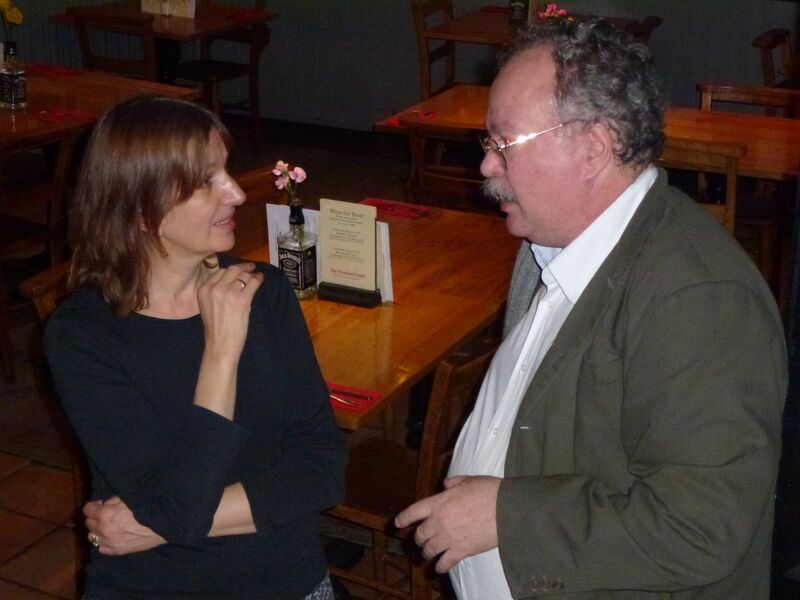 The Scottish poet – friend as well as translator of Borges, Neruda and García Márquez – spent a large part of the day talking with me about Latin America and its literatures, especially Borges. 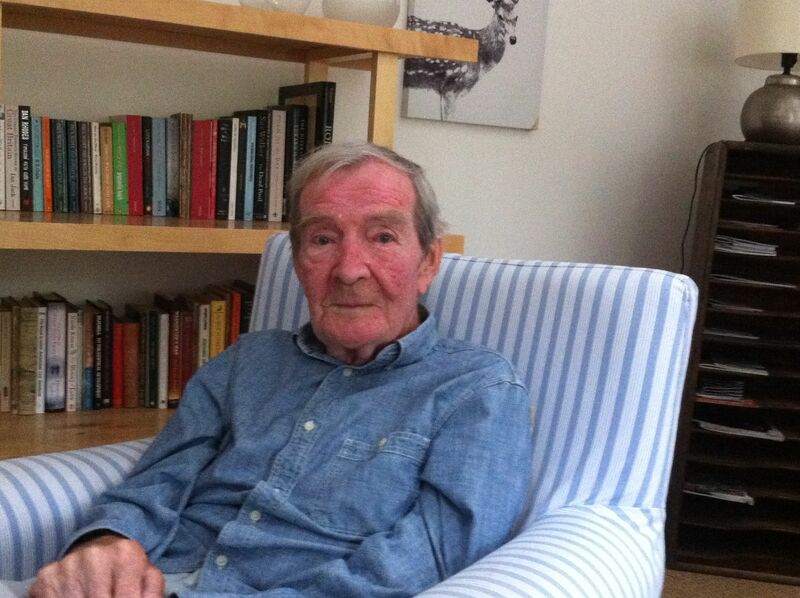 I recorded the conversations, and consider myself incredibly fortunate to do this as, just over a month following my visit, Alastair passed away, at the age of eighty-eight. Latin American society lives, by and large, by a species of make-believe . . . a highly personalised, anarchical make-believe, in which each individual spins around him, like a cocoon, his own little world of pretense, and demands its recognition by others as the condition of his participation in the social process. A fiction is any construct of language – a story, an explanation, a plan, a theory, a dogma – that gives a certain shape to reality. And it is with this in mind that we must think of Fiction Fiesta; not in the limited sense of a festival that celebrates the genre of literary fiction. FF is a platform for building fictions that give shape to reality. 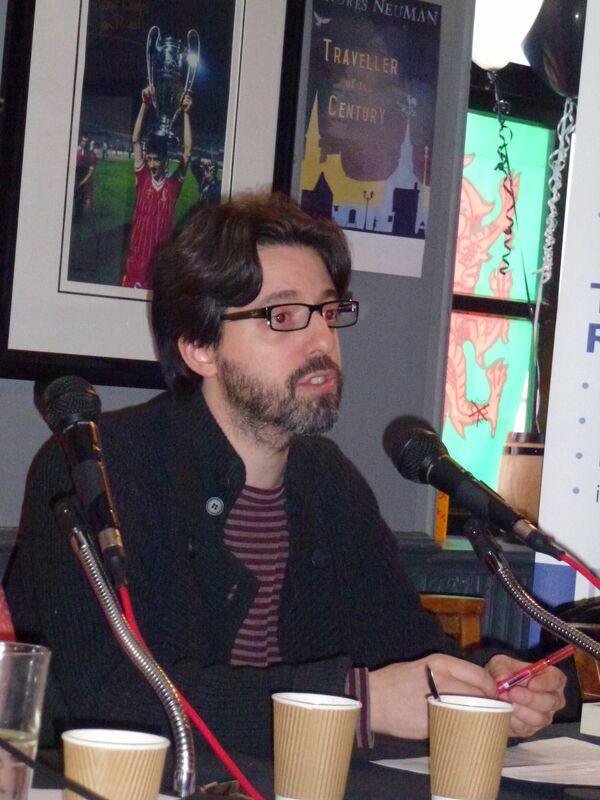 On one level, FF complements work that I am doing, alongside others – with the invaluable support of Wales Literature Exchange and Wales Arts International – in taking Welsh writing out into the wider world; at the same time we are helping Welsh readers discover more about contemporary Latin American writing. Nick got some money from the San Miguel brewery and I managed to secure some from Cardiff University and the thing was on. 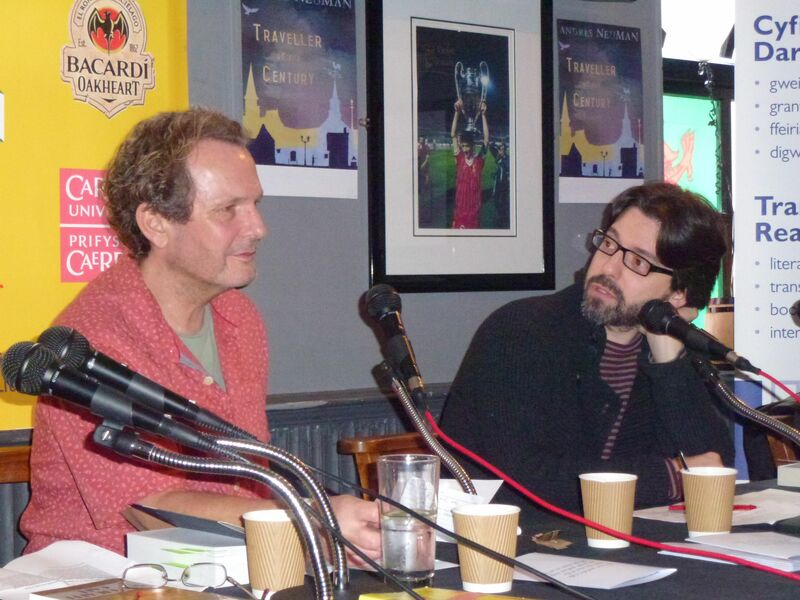 We followed up in 2013, with an Arts Council of Wales small festivals grant, inviting Eduardo Halfon from Guatemala, Inés Garland and Andrés Neuman from Argentina, alongside writers from Wales and elsewhere in the UK, and The Independent covered the event, with a feature on one of our guests, Angharad Price, which attracted more attention. It was never our intention to put on a big festival. 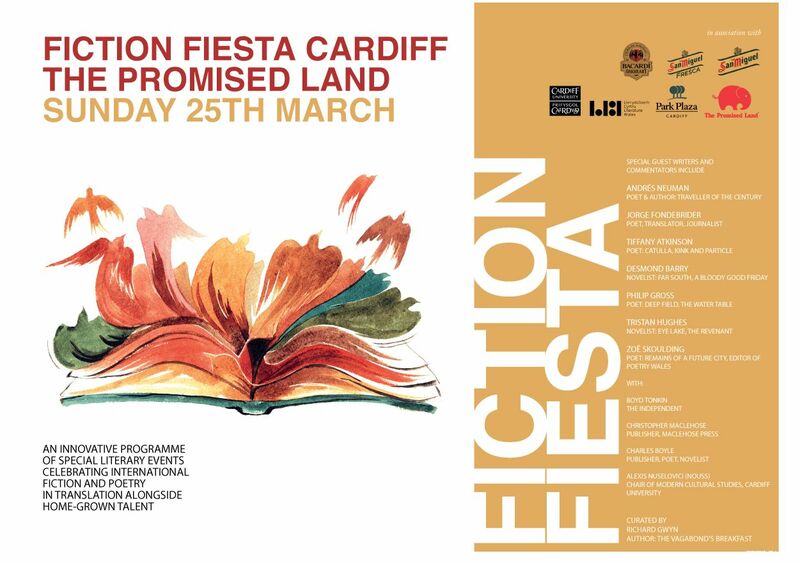 We always wanted Fiction Fiesta to retain a sense of intimacy that came from holding the first edition of the fiesta in the upstairs room of a local pub. And we wanted to keep a sense of celebration, of literature as something to be savoured and enjoyed by readers, like food and drink, which the large-scale corporate festivals cannot provide. 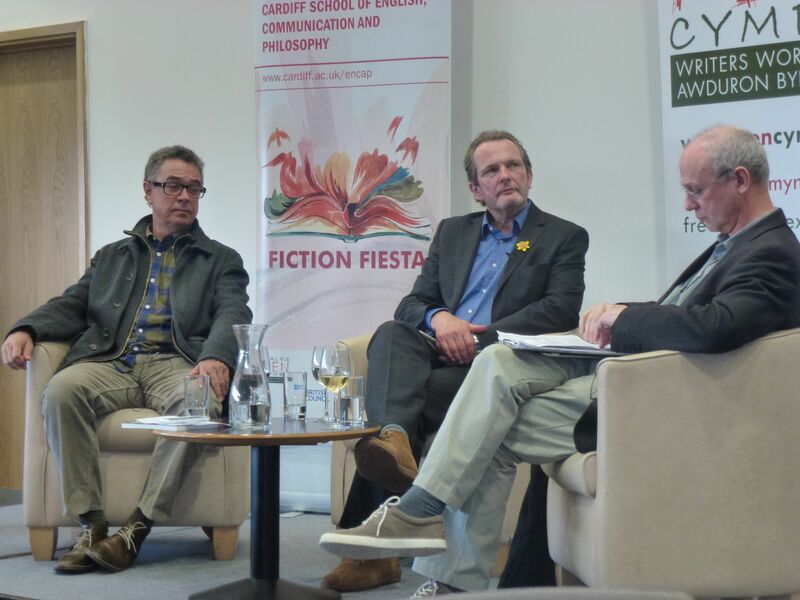 In addition, we wanted Fiction Fiesta to help develop contacts and friendships between Welsh writers and writers from Latin America, which, as I explained at the start of this piece, is where a lot of my own literary interests are centred. 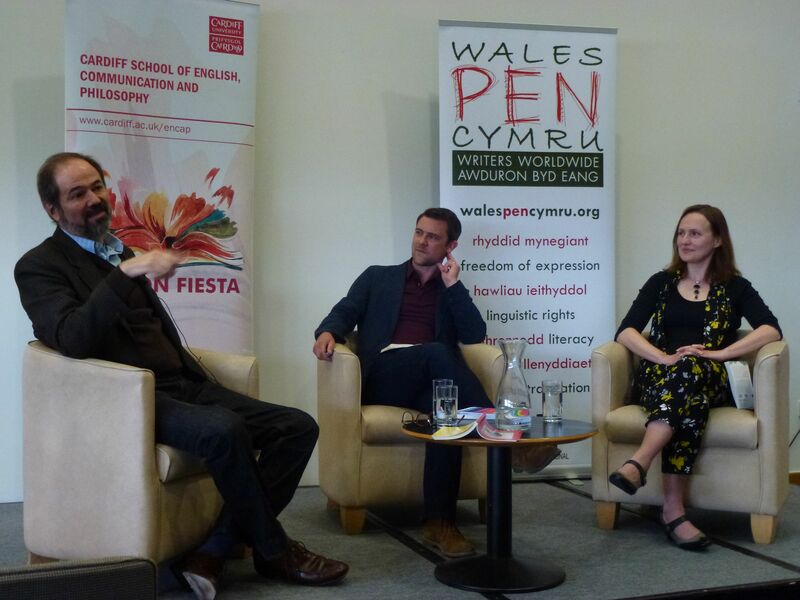 This year’s Mexico-themed Fiction Fiesta teamed up with Wales PEN Cymru and the British Council to hold an event at the Wales Millennium Centre on Friday 17th April. 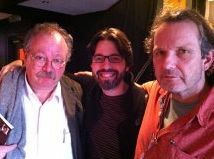 Owen Sheers hosted the Mexican writer Juan Villoro, along with Francesca Rhydderch, while I was in conversation with Pedro Serrano and the Scottish poet W.N. Herbert. 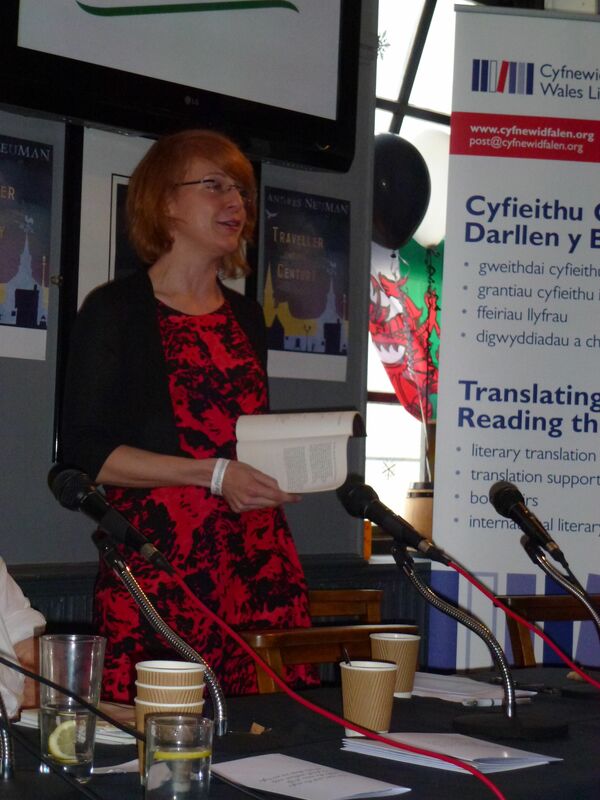 FF is hoping to maintain the partnership with Wales PEN Cymru, and bring many more writers from Latin America to Wales over the years to come. 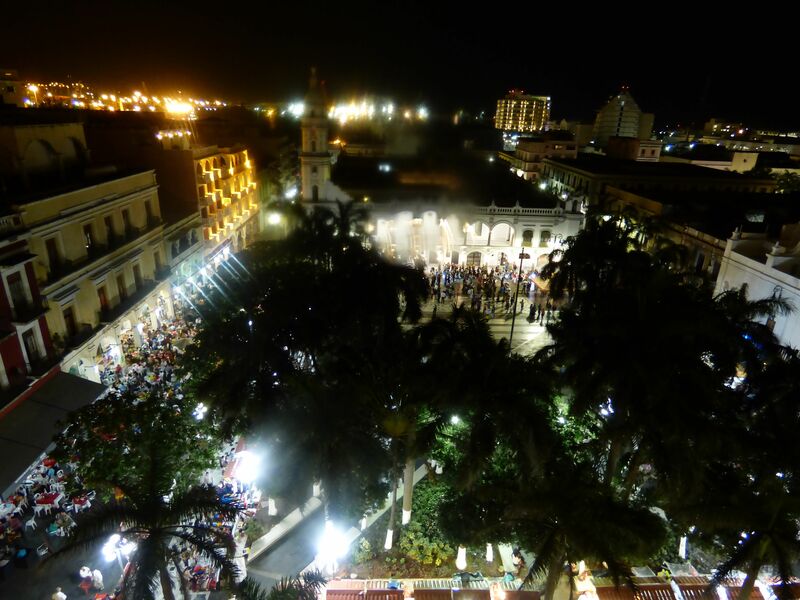 Leaning over the balcony of my room in Veracruz on a Saturday night. It is hot and the air is dense, the sky laden with clouds that have not broken all day, suggesting, to me at least, some faintly tragic element– as if a foreboding – to the festive sounds emanating at full blast five floors down. Why foreboding? Because this much noise must be a cover for something, full-blooded defiance of some kind. The son band has started up, and couples are dancing in the Zócalo, moving with slow steps, a synchronised animal of multi-hued and diverse features. And all of a sudden I turn around, almost certain someone has entered the room behind me. Of course, there is no one there. The door is locked. But I am in a strange hotel, in this noisy, sweaty city, after the relative quiet and familiarity of the coffee-growing uplands in Coatepec and Xalapa. I venture downstairs and sit outside the bar attached to my hotel. When I say the band has started, I am not being strictly accurate, as if implying there is only one band. There are currently several bands playing in the square, which, to use a common analogy, is the size of a couple of football pitches. In addition there is a group of bikers from San Luis de Potosí, who have parked their machines in the southwest corner of the square and planted massive speakers alongside them, from which blasts heavy metal at a volume which overrides most of the other sources of sound, the throbbing bass lines producing a physical response in the pit of the belly. As in the UK the bikers are predominantly middle-aged men wearing inscribed black t-shirts barely covering bulging bellies. They rev the engines of their Harleys, sending out a direct challenge to the mariachi band playing closest to their patch. There are at least four other mariachi bands playing, and a larger band for the dancers. To add to the cacophony hundreds of birds, occupying the many trees around the plaza maintain a shrill and manic chirping, flitting frantically from perch to perch, sometimes singly, other times en masse, dislodging a rival group from a neighbouring tree, who fly away squawking to find another haven. Police sirens and an unremitting blasting of horns from the bumper-to-bumper traffic add to the great noise. A fresh contingent of mariachi trumpeters arrives to my right, offering a more local assault to the eardrums. This is, quite simply, the noisiest place I have ever been, its orchestral totality rendering the Plaza Castillo in Pamplona on the opening night of the San Fermines into sedate chamber music by comparison. 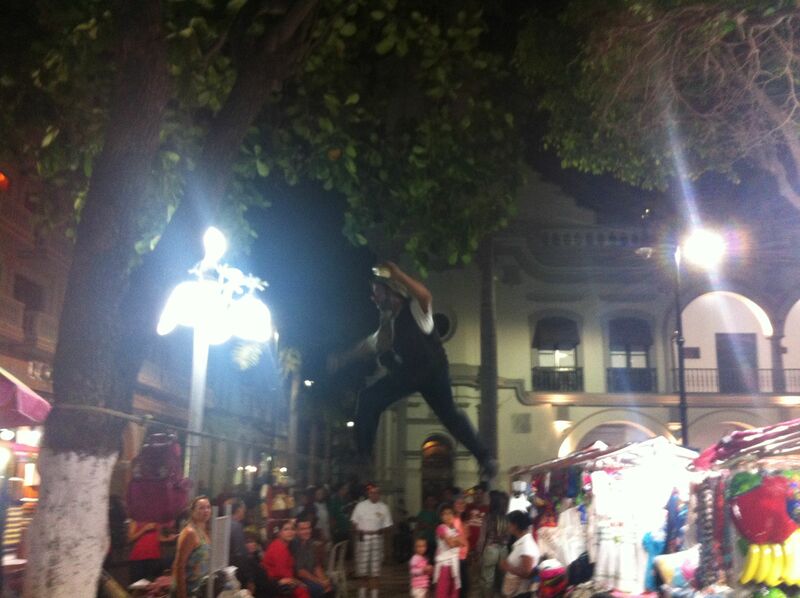 But here there is no fiesta, it’s just a normal Saturday night in Veracruz. I was told to expect a lot of noise, but nothing could have prepared me for this aural onslaught. It is beyond sound, it is a dense, geological layering of noise upon noise, of massive dimensions. Outside in the street, a big red Ford truck pulls up, and six very fat men pile in. I look around to see if anyone else has noticed this strange occurrence, but perhaps in Veracruz this kind of thing happens all the time. At the table in front of me, a smartly dressed man with European features is writing in an A4 pad. What is he writing? Amid all this noisome, somewhat seedy racket, could there be a second scribe, a cover version of Blanco, doing exactly what Blanco does? Could he, at this very moment, be describing how there is this person seated behind him, who is a cover version of his own alter-ego? There is always the other one, doing exactly what you are doing, thinking your thoughts, writing your story, singing your song. At the table to my right sits a small, slight gringo who bears a certain resemblance to Stan Laurel and wears a forlorn moustache and camouflage cargo shorts and a t-shirt with an inscription that I can’t quite make out without standing in front of him and peering, which I have no intention of doing. He is talking to his Mexican friend, in English. The Mexican begins every other sentence with the words ‘one day’. One day I this one day I that. Esto y esto y esto. The other tables are filled with Mexican holiday-makers or weekenders. My other gets up to leave. He reaches down and fetches from the floor a hard hat, of the kind worn on building sites. I see. He is probably a surveyor or building site manager, and he was filling out a report. Never mind. The bikers amble by in a group. They are wearing a uniform: sky blue shirts and black leather waistcoats, or vests as they say in the U.S. In the square itself I can see jugglers and clowns and drag artists and con artists and little stalls selling cigars and wooden toys and junk of every possible description. A very young woman, attractive and haunted-looking, with a sweet child in a sling on her back comes by selling knick-knacks made from woven thread. The pair to my right, who are both quite drunk by now, each give her a twenty peso note (about £1), the gringo pointing to the child insistently as he hands it to her, as if to say, it’s because of her, your child, that I am bestowing such munificence on you. Alcohol-driven largesse. The woman in the group directly in front of me hisses loudly to catch the waiter’s attention. He ignores her. She tries calling ‘Joven!’ (Young Man!) instead, which works, and he half-turns, careful not to dislodge any of the bottles and glasses he carries on a tray high above head-level. The light on the black wooden surface of my table is refracted by the revolving overhead fan above me, turning the shiny table-top into a swirling vortex, inviting me in. I realise at this instant – with the gratification that accompanies every minor epiphany – that I don’t truly know anything, and probably never will. But at least I have the salvation of continuity, and the exquisite tension of the unfinished journey. The gringo and his friend leave. When I get up to pay, I notice that the gringo has left his small backpack leaning against the wall beside his table. I tell the waiter, so he can keep it behind the bar for when the poor fellow realises he has left it somewhere. I take a last turn around the square. An old man with no shoes, extremely drunk, takes a slim bottle of cane rum from his back pocket, swigs the remaining dregs and slings the plastic bottle away with an angry gesture. He is so drunk that he is taking part in one of those hallucinatory boxing matches that certain drunks get into, and he staggers on, fighting his imaginary enemy. One of the last performances of the night – it is after 3.a.m. 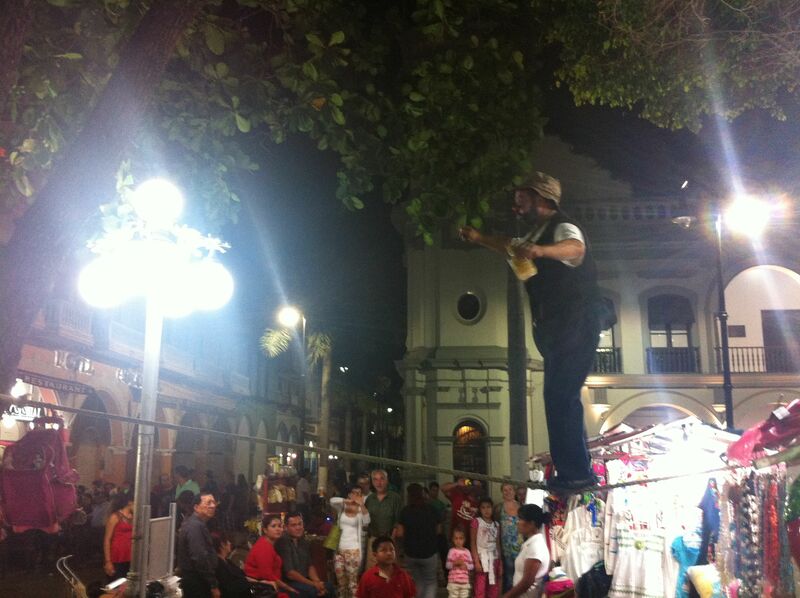 by now – is underway: a tight-rope walker, who has planted his rope between a tree and a lamp-post. He is pretending to be drunk, and is supping from an identical bottle of cane rum to the one the man with no shoes just threw away. 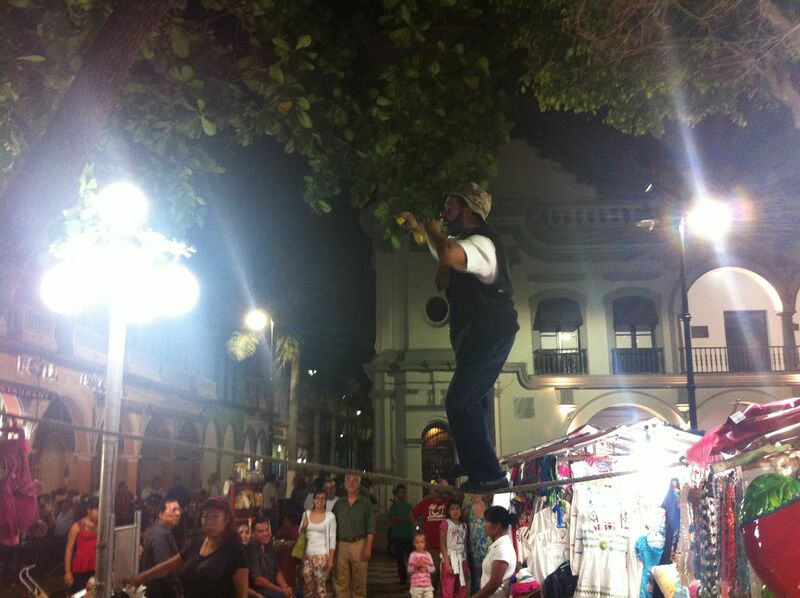 The man with no shoes abruptly stops his shadow-boxing, and stares in evident confusion at the tight-rope walker for a few seconds, before letting loose a string of profanities, and stumbles on his way across the square. When travelling, how do we begin to learn when someone is wearing a mask, with intent to deceive, given that we all wear masks much of the time? We all know, as Hamlet says, that ‘one may smile, and smile, and be a villain’, and so I am thinking about how one goes about making judgements in another culture with people whose ideas about what qualifies as ‘sincerity’ is, perhaps, at a remove from one’s own culturally engendered version. And how, I wonder, do ‘I’ appear, the person who passes as myself (my own current person impersonator) with my own pretensions at ‘sincerity’, when for all my interlocutor knows, I am wearing a mask too, perhaps one more efficacious in design than his or her own. These things trouble me. Should they? And how much does any of this matter, if, as Javier Marías reminds us in his novel The Infatuations (Los Enamoramientos), we are all novice ghosts: ‘whatever we do, we’ll only be waiting, like dead men on leave, as someone once said’. A mask conceals, but to wear death on the outside conceals nothing, nada: it only reveals what we wear on the inside, what we carry inside us – our own eventual death – because we are ‘dead men on leave’ and one cannot conceal what can never be erased. So the mask of death, the grinning skull, is a double bluff, it is a way of anticipating our status as fragile ghosts, a way perhaps of trying to con or cheat or temporarily delay Death into thinking we are already dead, so he cannot choose us, he needn’t waste his time with us. This is not the same as the rather simplistic explanation I have read in tourist guides, namely that Mexicans like to display images of death and the skull in order to familiarise and trivialise it, to make it commonplace, to deny it real significance by flaunting it through macabre displays, even to the extent of eating chocolate skulls and skeletons. That, surely, would only constitute a bluff (a single bluff). And Death would not be fooled by that, surely? 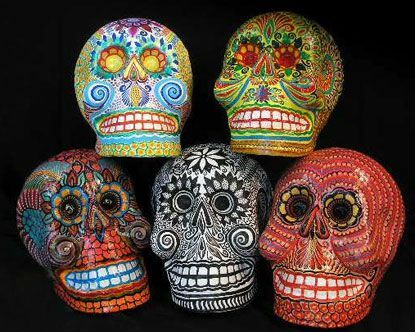 How does a people – according to Claudio Lomnitz in his extraordinary book, Death and the Idea of Mexico – come to have death as its national icon? This question was addressed at length by Octavio Paz in his seminal study on the Mexican character, or what I am coming to think of as Mexicality, which manages to carry an almost-reference to mescal, the national liquor (usurped for many years by the Jalisco version, tequila, but making a fierce comeback among the middle classes, who previously eschewed it as a poor man’s drink). It is a view corroborated in Mexican culture by the prevalence of further imagery of death: not just in the ‘national icon’, as Lomnitz would have it, but in the extraordinarily graphic pictures (which would never be publishable in a UK newspaper) that accompany headlines of the latest narco-murder, and which, significantly, also accompany the paraphernalia of Christian death – exemplified by Christ’s death on the cross – here represented in a crucifixion scene I photographed yesterday in a Coyoacán church. 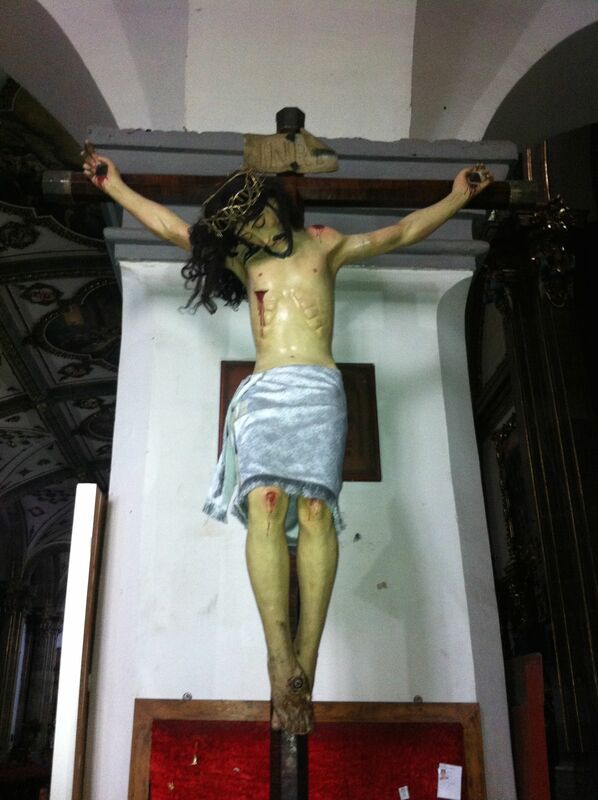 A bloodied Christ, with real hair. None of this will be new to anyone who knows anything at all about Mexico, but for me the whole symbology of death, celebrated so vividly in fiestas such as the Day of the Dead – well, all fiestas in fact, as the essence of a fiesta is to defy death, to celebrate a momentary explosion in time, thereby provoking an attraction of opposites: the fiesta beckons death by celebrating life with fanatical and joyous hubris – is a topic definitively at odds with our Western denial of death, our sterilising and alienating distancing of everyday life from any possible contact with the unspeakable void that death represents. But these are only preliminary thoughts on the topic, to which I may one day return. 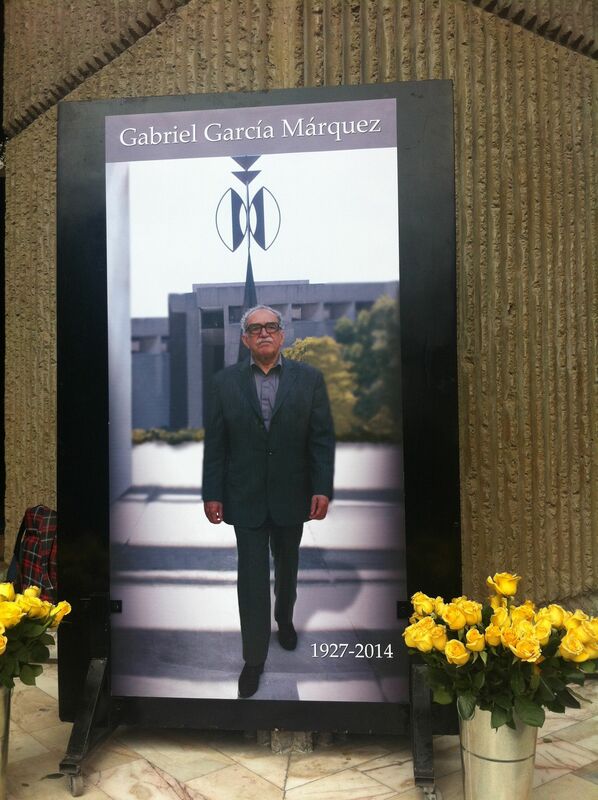 At the Festival of the Book and the Rose, which I attended yesterday, as a guest of the Periódico de Poesía, the celebrations were adjusted at the last minute to make way for an homage to Gabriel García Márquez, pictured below, on a placard, flanked by yellow roses. I also learned that the University (UNAM) is home to 325,000 students: the same population, give or take a few dozen, as the city of Cardiff. 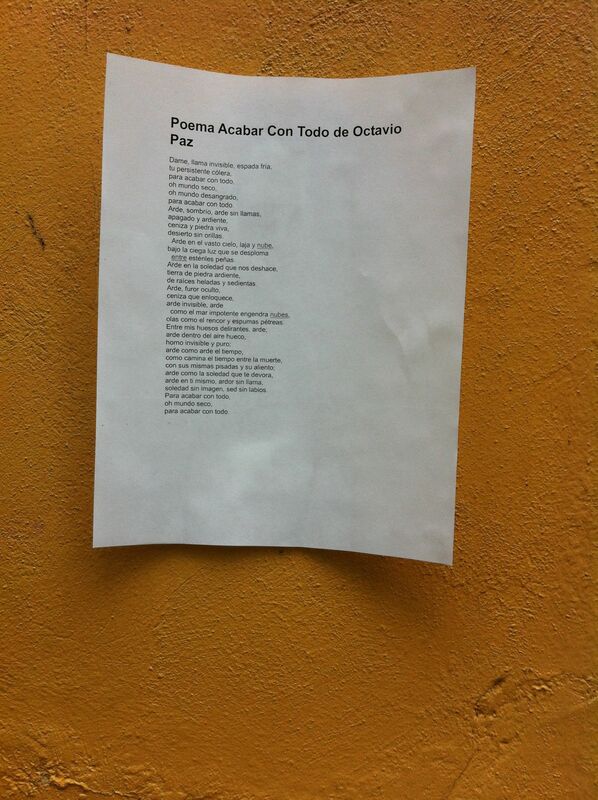 Poem stuck on wall lamenting the excess of celebration over Octavio Paz Centenary. 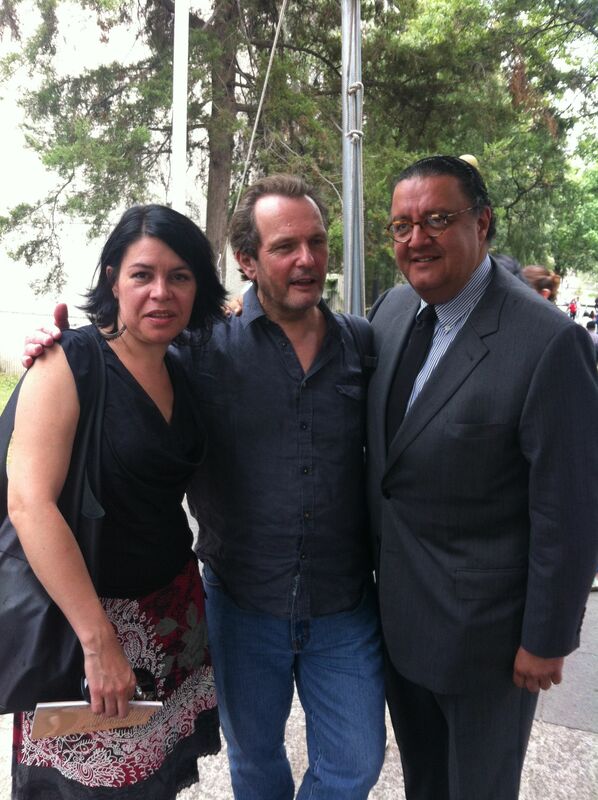 With Ana Franco of the Periódico de Poesía and novelist and interlocutor par excellence, Jorge F. Hernández. 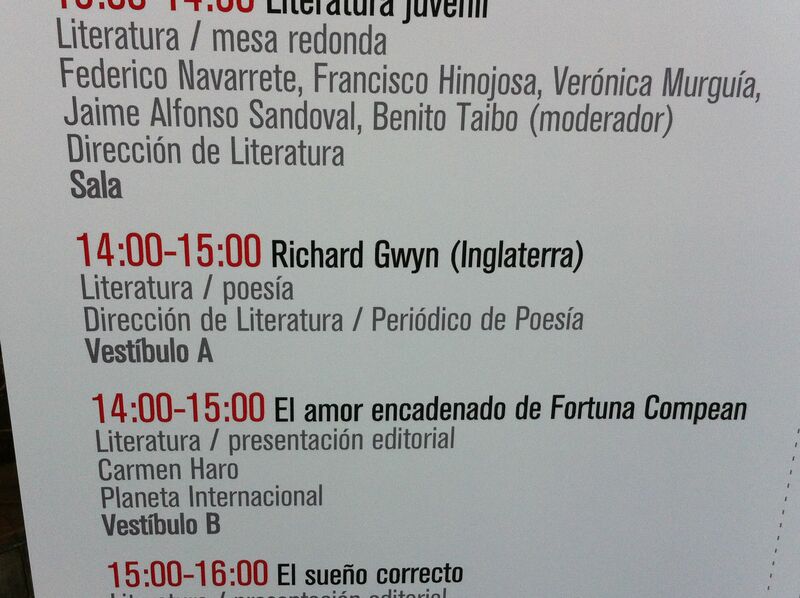 Inglaterra? Really? A tragic misallocation of nationality or a simplification for the geographically challenged?. 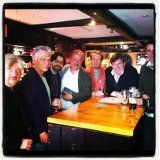 We met up in Nick’s bar, The Promised Land, to discuss literature in translation with some friends, editors, writers and such luminaries from the field of literary translation as Christopher MacLehose and Boyd Tonkin, chaired by the erudite and perennially entertaining Charles Boyle. 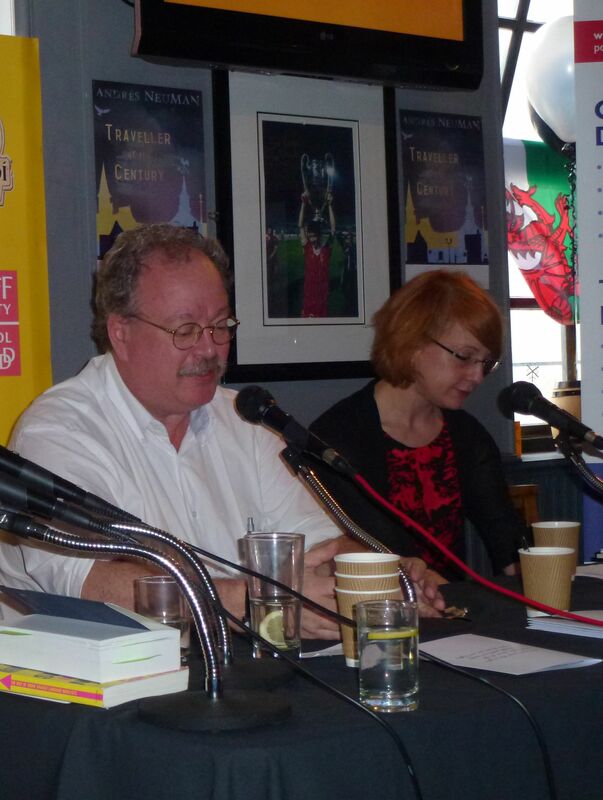 By the end of the day I had the impression that we had achieved what we set out to do: we had talked about interesting stuff in good company; we had provided a forum for our guests to listen to and discuss literature in translation, and we had introduced to a Cardiff audience – for the first time but definitely not for the last – the prodigiously talented Argentinian novelist and poet, Andrés Neuman. More than that, most of us seemed to have enjoyed ourselves. The day began with a reading and discussion with Andrés, who led us on a merry dance through Russian Jewish migration of the early 20th century, German Romanticism, the music of Franz Schubert, European identity in the 21st Century, an hilarious impersonation of Jorge Luis Borges, and an account of a chess game with Roberto Bolaño, in which the Chilean author plied his young admirer with whisky while playing Mexican heavy metal at full volume as a way of gaining tactical advantage. 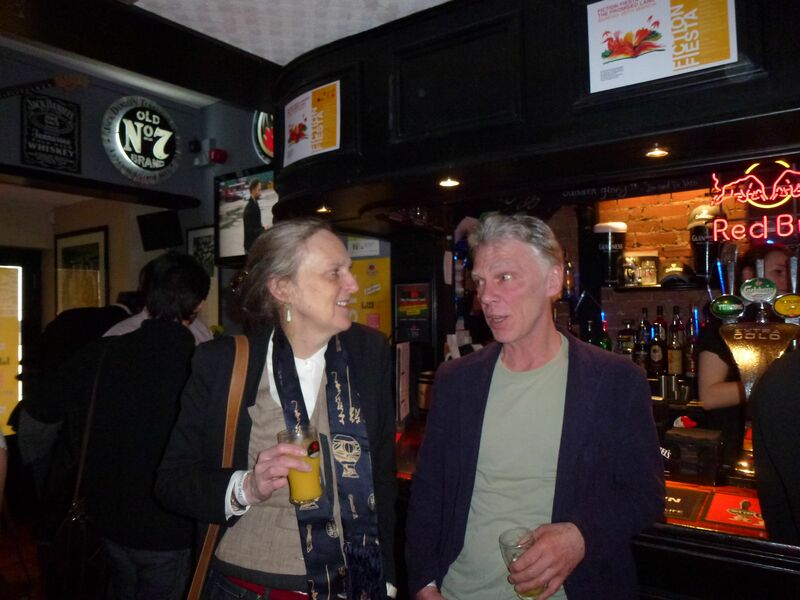 There followed a delightful reading by the poets Jorge Fondebrider and Tiffany Atkinson, their lines bouncing off the walls with a playful (and sometimes darker) exchange of ironies. The Fiesta was made by its participants, especially our Argentinian guests, and the fine writers who made the afternoon come alive: Des Barry, Zoe Skoulding, Tristan Hughes and the superb Philip Gross. In the end it all went swimmingly, although afterwards I wondered – rather like a medieval adventurer returning from the Forest of Enchantments – whether it had all been a mysterious dream. But that was probably just the lack of sleep. The whole sick crew? - Barry, Boyle, Neuman, Fondebrider, Blanco, Mulcahy, Hughes. A joyful retort to the Greek debt crisis. Watch out for the Ottawa Zorba Sweepers at the end. What professionals!